“When we talk about the developing world, the idea of resilience and the idea of the ability to either withstand or recover from shocks often has to do with the way people are able to manage their natural assets,” said Cynthia Brady, senior conflict adviser at USAID’s Office of Conflict Management and Mitigation, at the Wilson Center on March 2. Natural resource management is critical to resilience as it is often entwined with conflict and climate change. The “Resilience for Peace Project,” a new partnership between the Wilson Center and USAID, explores multi-sectoral approaches to aid and climate change adaptation in conflict-affected and fragile states. “Issues of resilience and conflict are often intertwined, and we’re working to understand how they’re connected in the context of our work,” said Melissa Brown, director of USAID’s Office of Conflict Management and Mitigation. “We can no longer treat conflict as an externality – something we can’t influence or do anything about,” Kurtz said. “By and large, we can and should be able to reduce the likelihood of violence as well as the consequences of that on human lives.” Brady noted that most of the places USAID is working in the developing world are both fragile and conflict-affected. For Kurtz, the challenge is finding approaches that can reduce the effects of conflict while building resilience in other sectors. Conflict most often occurs in conjunction with other failures, such as political crises and economic shocks, and these triggers should help determine what type of aid is most effective from context to context, he said. An additional shock that can exacerbate conflict is climate change, said Brown. “There is growing evidence that suggests the majority of the world’s fragile and conflict-affected countries will also be highly exposed to the threats of climate change, particularly in parts of sub-Saharan Africa and South and South East Asia,” she said. USAID has been working to address this connection since 2011 through a series of missives making resilience a centerpiece of efforts to address recurring crises and incorporate climate change adaptation into development, said Staal. In one pastoral community of southern Ethiopia where Staal worked, the majority of wells were functioning poorly – some producing no water at all. When drought struck, pastoralists were forced to move their cattle elsewhere, creating friction and conflict with the people who were already there. A previous USAID approach might have been to use humanitarian funds to truck in water once conflict had broken out. 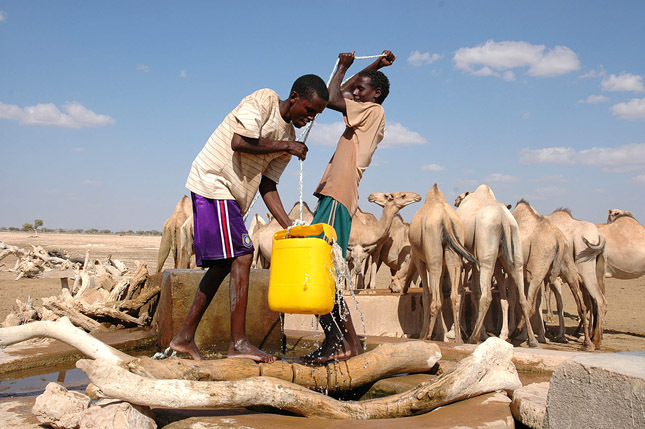 But under a resilience framework, USAID took into account the underlying issue and repaired the pastoralists’ wells. This approach was not only cheaper, it addressed one of the structural issues behind the community’s displacement and gave them the tools to prepare for the next drought. Such environmental cooperation can yield a peace dividend, said Kurtz. He detailed how conflicting groups in another community in southern Ethiopia had gone through trust and peacebuilding activities over shared resources that then helped them navigate future environmental difficulties. When drought hit in 2011, the groups were able to negotiate access to more distant pastures and previously unavailable water points thanks to the precedent and skills the peace process had given them. Understanding the links between the environment, conflict, and development is critical as the world is facing a “triple threat” of globalization, population growth, and climate change, said Sundaa Bridgett-Jones, associate director of International Development at the Rockefeller Foundation. And while resilience is often talked about in the context of developing countries, the purview for these concerns is growing. The Sustainable Development Goals, for example, are expected to apply to all countries. “We often talk about things in certain regions: the data rich, the data poor, the Sahel versus South and Southeast Asia, but no matter where we are, we’ve seen these challenges,” Bridgett-Jones said. Staal said that a focus on gender has helped build resilience in Ethiopia, particularly over land disputes. Women’s names were often left off land titles, so if the male head of household died before his wife, she might face challenges from other family members. By providing land certification that included the wife’s name, there was greater understanding about land boundaries and conflict decreased. Certification even led to more productive farming. “The yield per ace went up between 11 and 40 percent with no other input other than a piece of paper that says, ‘I have some guarantee that this is my land,’” said Staal. Photo Credit: Pastoralists pull water from a well in Somali region of Ethiopia, courtesy of flickr user Andrew Heavens.